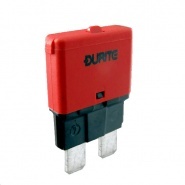 Circuit Breaker, red 10A, for 12-24V DC systems, will replace standard blade fuses in many fuse-holders and boxes. 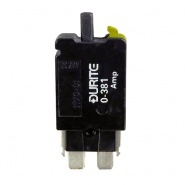 Fuse circuit breaker to replace automotive blade fuses where a trip circuit is required. These type of circuit breaker have the standard sized blade to suit standard (high topped) automotive blade fuse boxes. Popular with race and competition vehicles, the breaker allows reset of a fused circuit. Resetting a fused position should never take the place of diagnosis, especially if repeated. Circuit Breaker, green 6A, for 12-24V DC systems, will replace standard blade fuses in many fuse-holders and boxes. Circuit Breaker, tan 8A, for 12-24V DC systems, will replace standard blade fuses in many fuse-holders and boxes. Circuit Breaker, blue 15A, for 12-24V DC systems, will replace standard blade fuses in many fuse-holders and boxes. Circuit Breaker, yellow 20A, for 12-24V DC systems, will replace standard blade fuses in many fuse-holders and boxes. Circuit Breaker, pearl 25A, for 12-24V DC systems, will replace standard blade fuses in many fuse-holders and boxes. Circuit Breaker, green 30A, for 12-24V DC systems, will replace standard blade fuses in many fuse-holders and boxes. circuit breaker, rated at 6A, for 12-24V DC systems, with manual re-set and manual trip, will replace some standard blade fuses. Circuit breaker, rated at 8A, for 12-24V DC systems, with manual re-set and manual trip, will replace some standard blade fuses. Circuit breaker, rated at 10A, for 12-24V DC systems, with manual re-set and manual trip, will replace some standard blade fuses. Circuit breaker, rated at 15A, for 12-24V DC systems, with manual re-set and manual trip, will replace some standard blade fuses. Circuit breaker, rated at 20A, for 12-24V DC systems, with manual re-set and manual trip, will replace some standard blade fuses.